When it comes to humanity, I remain hopeful. But when it comes to politics, I have learned to be a skeptic. But what I witnessed today during Prime Minister Abiy Ahmed’s rally at the Convention Center was a powerful reminder that love is greater than vengeance. For too long, my homeland Ethiopia has been torn apart by conflicts and resentment. A nation that survived intact for 3,000 years was rupturing at the seams and facing an existential crisis. In this toxic environment of anger, few wanted to give an inch and everybody wanted to be the winner. In the process, all were losing as they hung bitterly to their egos. That is why what happened today was such a watershed moment. Dr. Abiy noted that moving forward as a people requires us to be forgiving to one another. Instead of using insults as hammers to diminish one another, he asked us to use the hammer (medosha) to knock down the walls of anger that kept us divided. He then followed up his words with action. Dr. Abiy, in his moment to revel in the glowing reception from the people, paused and invited Tamagn Beyene to the stage. Tamagn had been an outspoken critic of the Ethiopian government for the past 27 years; his fierce opposition to the TPLF junta made him a provocative figure in the realm of Ethiopian politics. 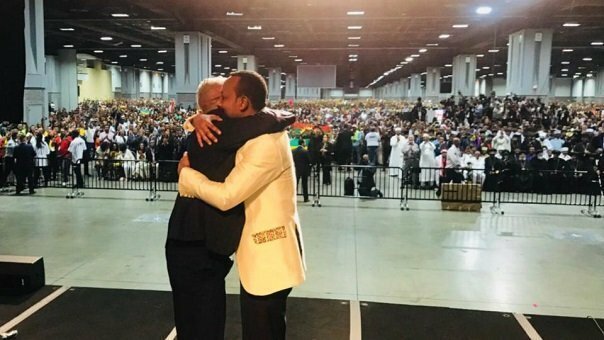 Both men hugged and showed fellow Ethiopians that love and unity is the only way we build bridges to tomorrow. This was an astounding scene to witness. In an social and political atmosphere where separable grievances are the norm, by seeking forbearance and saying yikirta (sorry) instead of seeking retribution, Dr. Abiy and Tamagn chose to walk a different path. If we are to heal from past wounds, let us hear each other out instead of yelling past one another. If we are to contribute to the struggles of our people back home, let our contributions be kindness and not antagonism. Many people have felt injustices from the past to this present moment, instead of trying to monopolize pains, let us have honest conversations followed by reconciliation. If you want your hurts to be heard, listen to others who hurt too. No more ene (me), let’s be the change we all yearn and make it about egna (us). Words and gestures alone do not feed mouths and give shelter, as long as there are people who despair and are condemned to a life of poverty and neglect by no fault other than their birth, we should not rest and think we have overcome injustice. Nonetheless, I know how important hope is to a people who have been wallowing in hopelessness for too long. This moment of togetherness can have a cascading effect if we let the love in our hearts lead us instead of being stuck looking back with animus. Dr. Abiy noted in his speech that if Ethiopia is held back, it’s not due to lack of resources, capacity or culture. What has been missing for the past four decades is the sense of unity we had before the Derg and the subsequent government shattered families and sent millions of Ethiopians into sedet (exodus). Since 1974, we have been beset by turbulence largely because we forgot about our cohesion. We are a people who eat together, pray together, celebrate together and cry together, if we are going to succeed as a nation, it will be because we do so together instead of bickering apart. As we look ahead, let us not give into the temptation that the solutions to what ails Ethiopia will be solved by one man let alone a government. We can’t outsource the hard work that it will take to lift tens of millions out of destitution nor should we leave it to political leaders and wash our hands of responsibility. As we demand a more equitable treatment for all Ethiopians without bias to tribe or class, we must also do more locally both back home and abroad. It is said back home that a thousand spiders can tie up a lion, but doing so requires to spiders to be active instead of sitting on the sidelines. Let medemer (adding) not be just a slogan but a compass that guides our decisions as individuals and as a nation. I pray for my birth land Ethiopia, may suffering come to an end, may the blessings of the land be shared instead of being hoarded, may we believe in community above selfish interests and may Ethiopia stretch forth her hand to God and be the beacon for Africa and the world.